Bhubaneswar: “ATHLOS ’18”, the annual inter-college sports meet is being organized by SportsCom, the Sports Committee of XIMB. This event is going to be conducted at Xavier Institute of Management, Bhubaneswar (XIMB) from 5th to 7th October 2018. Athlos’18 gears up to become the grandest inter B-School Sports Meet yet. Appealing to their passionate, yet sometimes overlooked side, Athlos’18 gives the opportunity to all the talented sportsmen across different B-Schools to put on their jersey, wear their pride on their chest and battle it out in this sports carnival. The chief guests for Athlos ’18 are Mr. Dilip Tirkey and Mr. Dilip Gurumurthy. Mr. Dilip Tirkey, Former Captain Indian Hockey Team, Fullback, is a renowned world class defender and also India’s highest capped international player with 412 appearances which is also the second highest number internationally. Mr. Dilip Gurumurthy, Former Olympian, Indian Basketball Team, has brought great laurels not only for India but also to the area of Malleshwaram by being the only Olympian basket-baller from Karnataka to have been selected for the Moscow Olympic Games in 1980. With a huge number of colleges pooling in from across the country, the participants will have to sweat it out in a variety of indoor and outdoor sports and prove their mettle to establish themselves as this year’s sports champion. The meet looks forward to being a successful celebration of the spirit of sportsmanship among the competing student participants of the various business schools. It aims at inculcating a sense of responsibility and teamwork in the minds of the participants who would be future managers of our nation. The teams participating this year are IMI Bhubaneswar, IIM Sambalpur, XLRI Jamshedpur, IIFT, VGSOM, KSOM, XIMB Alumni and XIMB Home Team. For this occasion, we are inviting our esteemed alumni, who have established themselves as the flag bearers of their respective industries, to put on their boots and polish their skills. Whilst we give them an opportunity to their playing days, it gives the entire XIMB fraternity an opportunity to interact with a variety of luminaries from various corporate houses, all under one roof, spread across two days. The inauguration ceremony was held today wherein our esteemed chief guests encouraged students with their inspiring words. 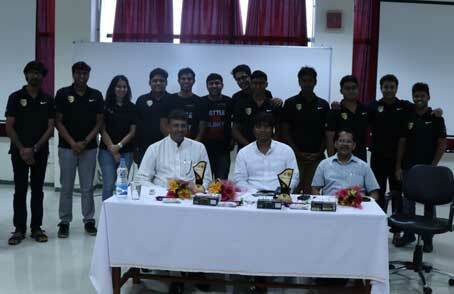 Mr. Dilip Tirkey appreciated the students’ dedication towards sports. He also quoted that “Fit youth will lead to a fit country” and thus emphasizing that we should maintain physical and mental fitness so as to contribute to the society in a better way. Mr. Dilip Gurumurthy explained how hard-work and discipline can help us succeed in life and encouraged us to maintain balance between studies and sports. This was followed by an inspiring speech by Father Arokia Das. The event was concluded by vote of thanks by the Sportscom co-ordinator Rachit Chaudhary.